VICTORVILLE, Calif. -- A man and woman were arrested in Victorville on suspicion of lewd and lascivious acts on their child, who was 5 years old at the time the investigation started. Authorities said in August 2013, the 5-year-old boy said he was sexually abused by his parents, 35-year-old Roy Ling and 32-year-old Sara Wilson. The victim and his parents were transients in the high desert. Detectives started an investigation and in March 2014 they tried searching for Ling and Wilson, but could not find them since they were homeless and moved around. 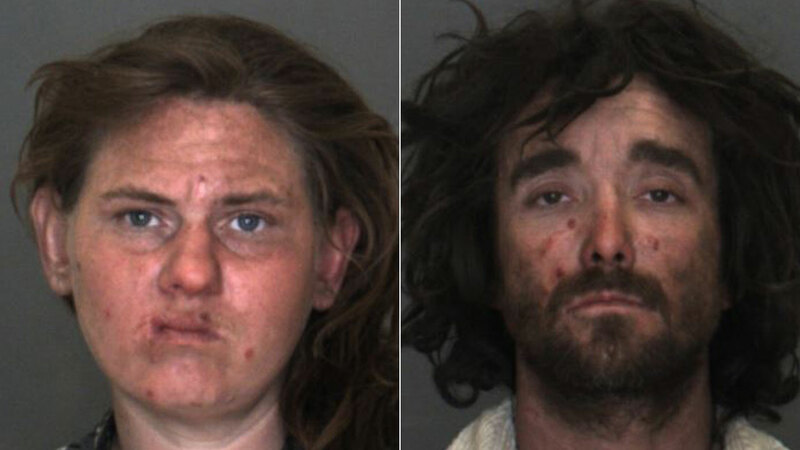 In December 2017, Ling and Wilson were found in a riverbed in Victorville. Investigators were told the couple may have also committed sexual acts on their dogs. An investigation was started again. On Valentine's Day, arrest warrants were issued for Ling and Wilson. They were found near Cottonwood and E streets. The couple were arrested on suspicion of lewd and lascivious acts with a child and booked into the High Desert Detention Center in lieu of $200,000 bail each. Anyone with more information was urged to call Detective Lisa Guerra at (909) 387-3517. Those wishing to remain anonymous may call the We-Tip Hotline at (800) 782-7463.